Add up to eight entertainment and office devices to your home network at Gigabit speeds. Transfer data 10x faster than Fast Ethernet, ensuring high-speed connectivity for up to 8 wired devices. 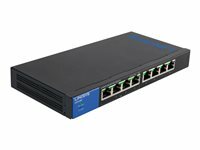 Simply connect up to 8 devices to instantly expand your network. Reduce buffering by prioritising high-bandwidth activities. Innovative feature reduces power usage for unused ports, while an on/off switch allows you to disable LED indicator lights. Maximise data flow and set the optimal speed for each connected device.